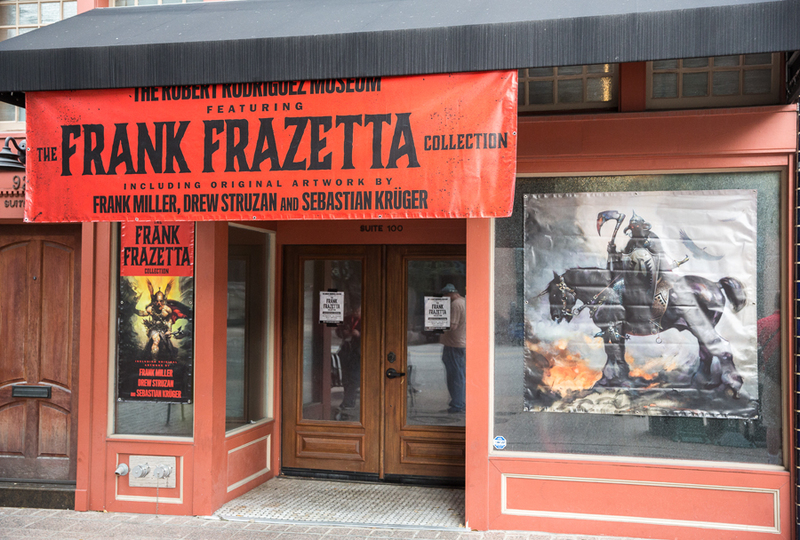 This blog post about the Frank Frazetta museum in Austin is not about music, but it is slightly tangential to music, since his works have been used as album covers by several artists. But some of you might know about Frank Frazetta’s paintings, his book covers and his comic books, and that is worth a post. 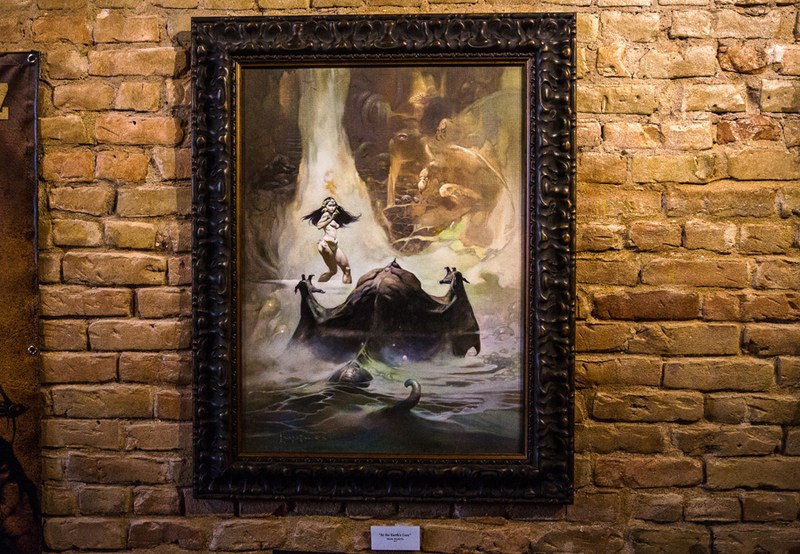 Frank Frazetta is maybe the most legendary fantasy painter. He died in 2010, 82 years old, and all his pictures were placed in a vault to protect them from family and others. 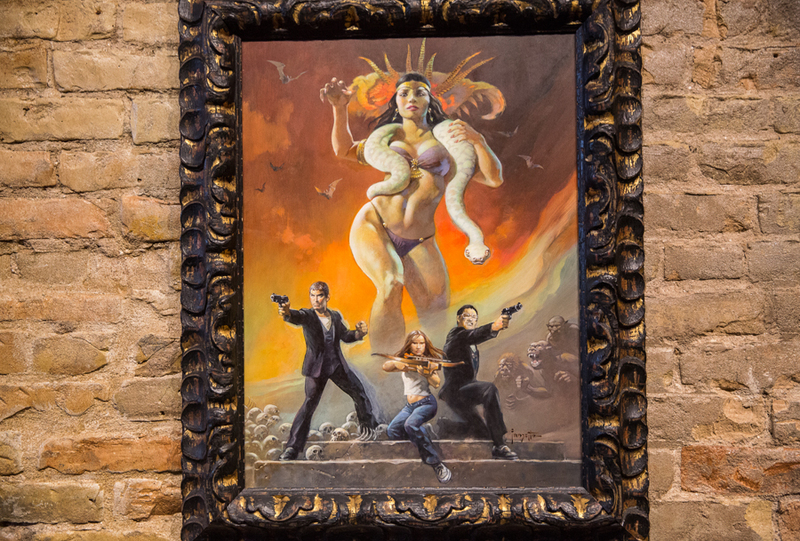 The film maker Robert Rodriguez had been a fan of Frazetta since he was a boy, and commissioned him to paint the poster for his movie From Dusk Till Dawn. Later he also painted other posters, and Rodriguez’ newest film project is to do a remake of the animation film Fire And Ice from 1983. The film will start shooting probably this year. I am no expert on neither fantasy, Frazetta or movie history, so bear with me if this presentation is somewhat sketchy. 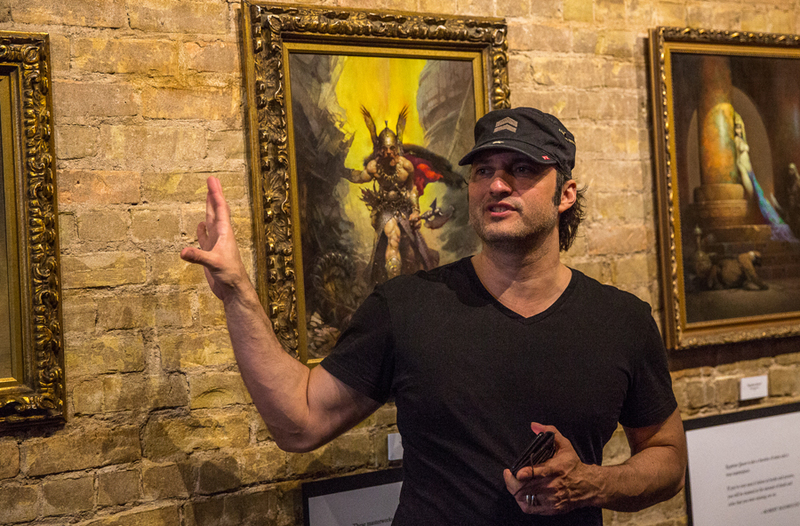 But I was invited to a special press tour with Robert Rodriguez to his Frazetta museum this morning, as part of the SXSW Film festival, and I just couldn’t resist. Since I know Rodriguez’ sister, the singer songwriter Patricia Vonne, I have also checked out his movies, and I am fascinated by his approach to storytelling and the esthetics in his pictures. He is also a good painter and has studied painting himself, something that was quite obvious when he showed us the paintings by Frank Frazetta. One of Frazetta’s most famous figures, is Conan The Destroyer. By coincident I saw part of the movie from 1984 last night, with Arnold Schwarzenegger and Grace Jones at the C-Boy’s Heart & Soul club while waiting for Barfield to start. 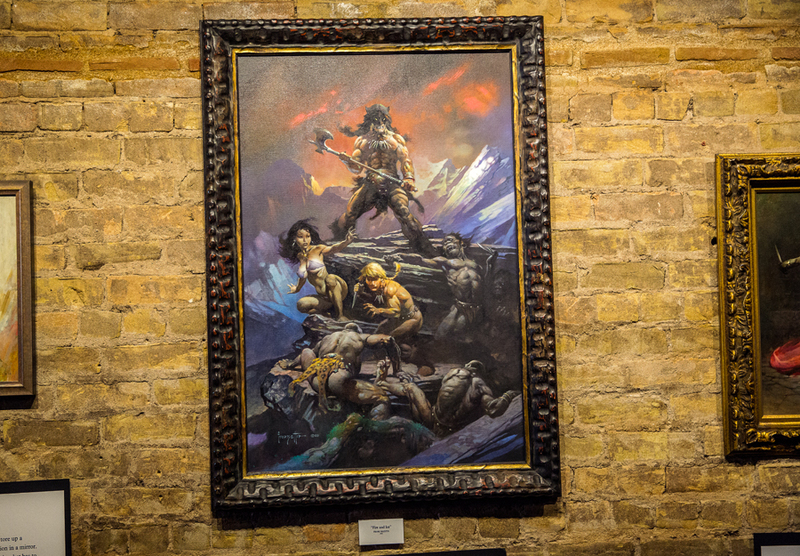 At that time Schwarzenegger was more like a comic figure, and it was a nice background to seeing Frazetta’s paintings, that the role is based upon. 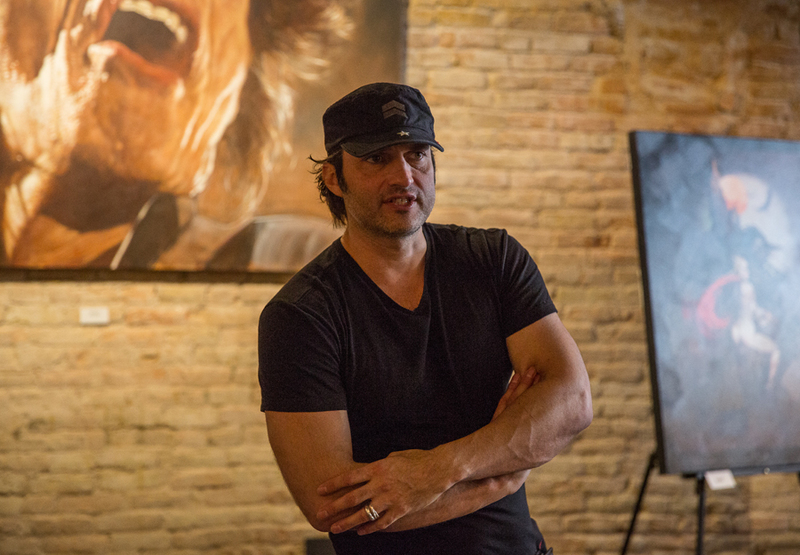 After Frazetta died, the family decided to let Robert Rodriguez by some of his paintings, since Frazetta knew him well and liked his style, and let year, Rodriguez opened his Frank Frazetta museum in Austin with the paintings, poster, plus some other visual artists Rodriguez have collaborated with. One of them is Frank Miller, the man behind the Sin City cartoons. Rodriguez recreated Miller’s universe in the first Sin City movie, and also the sequel, Sin City, A Dame To Kill For. The other artist that is represented in the museum, is Sebastian Krüger, who paints with a photo realistic likeness. 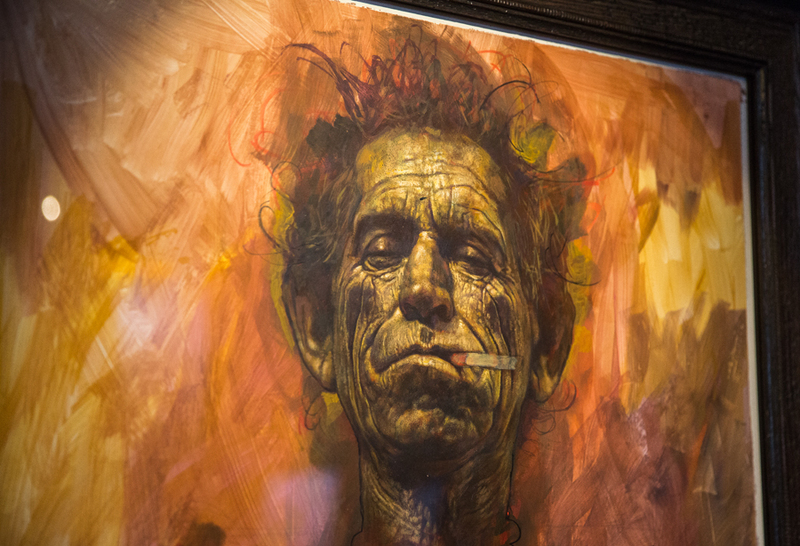 Two of the paintings in the gallery is by the Glimmer Twins, Mick Jagger and Keith Richards. 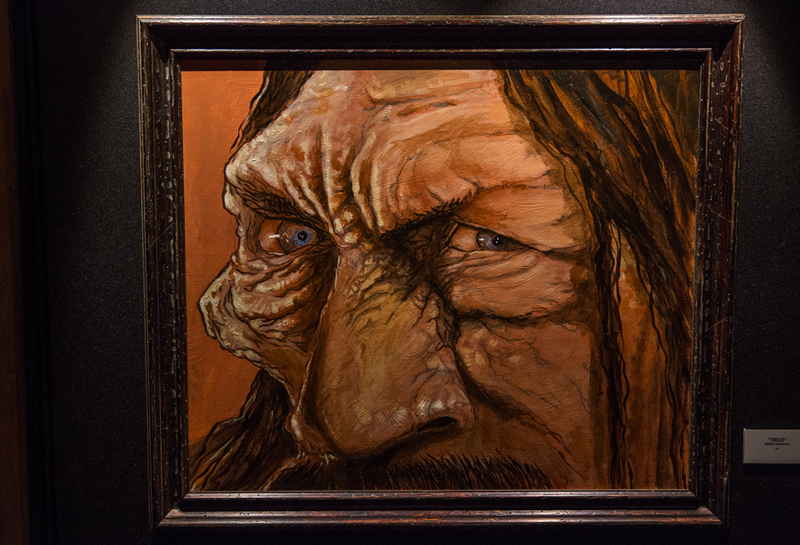 He has also painted the actor Danny Trejo, who starred in Machete by Rodriguez from 2010. 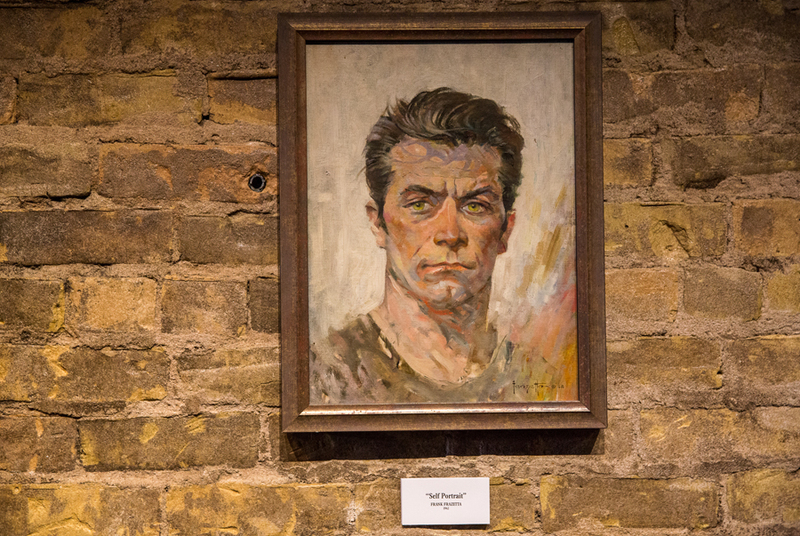 A fascinating part of the museum holds paintings that Rodriguez’ actors have made. He gets them to paint their character, and then he finishes the paintings afterwards. He said in his presentation that now actors demand to do a portrait before they start shooting. 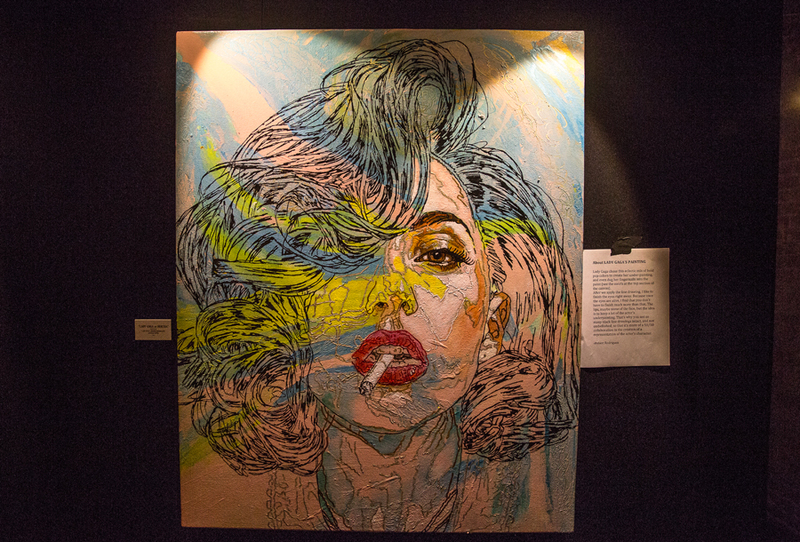 Rosario Dawson and Lady Gaga were two of the artists here. The tour was a fascinating trip to a visual landscape I don’t know very much about. It is obvious that Rodriguez is serious about his museum, and it is well worth seeing. Rodriguez is well schooled in visual composition, and pointed out the Frazetta’s use of triangulation in almost all his paintings. 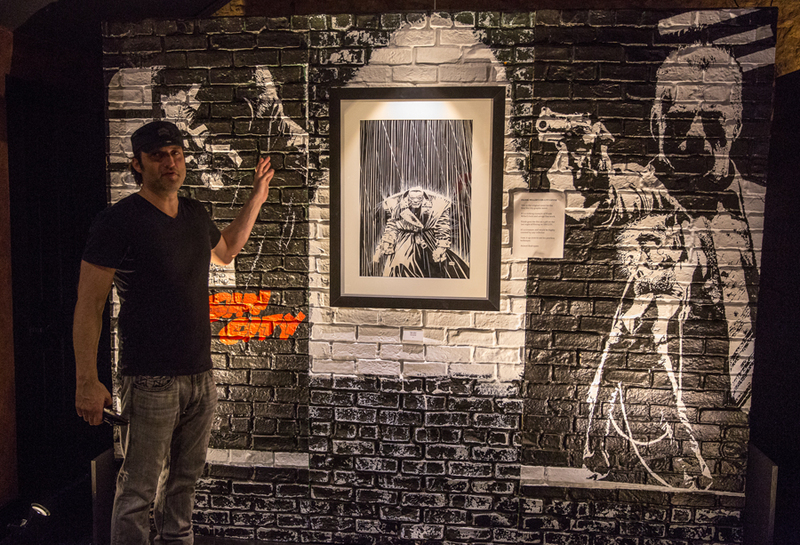 Many of the paintings in the museum are worth a lot, among them Frank Miller’s original painting for his first Sin City edition. 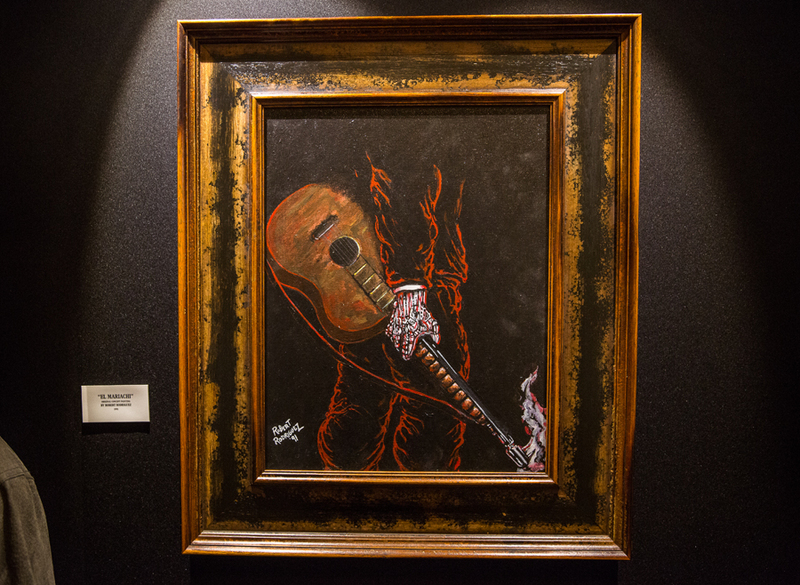 There are also a couple of Robert Rodriguez’ own paintings, and sculptures plus some film effects. All paintings are © of the owners and must not be used without written permission. 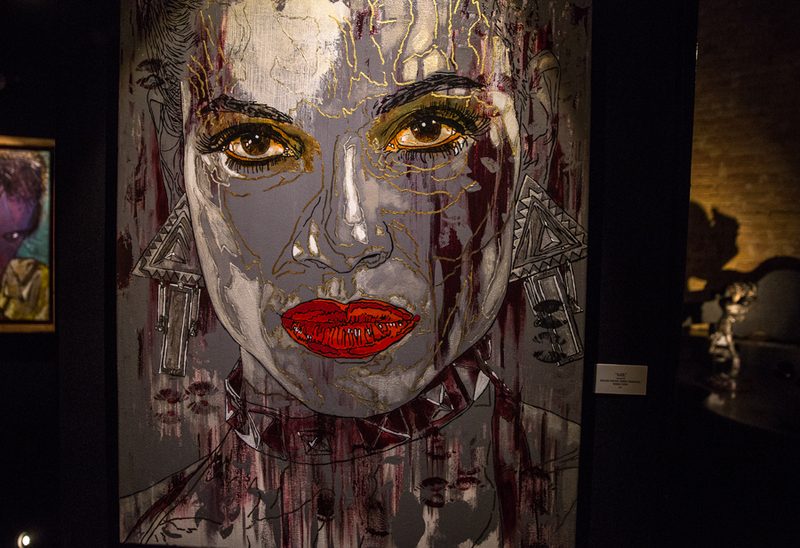 This entry was posted in SXSW, Uncategorized and tagged Austin, Conan, Frank Frazetta, Frank Miller, Lady Gaga, Robert Rodriguez, Rosario Dawson, Sebastian Krüger by Per Ole Hagen. Bookmark the permalink.